I had a sleepless night, running back and forth to the bathroom. Sunday my stomach seemed to have settled down and I took advantage of that reprieve. Bright and early Monday morning I called the GI doctor. She was totally booked for that week and I went into begging mode. When the doctors PA called me back, I did more pleading and got fitted into a slot in their office 45 minutes from my house. "Oh well, I'll take it," I said! I was in desperate mode. Someone needed to figure out why I couldn't use the bathroom. Laxatives were not the answer. As we talked more about my problem, she hit me with the bomb shell. "Your bowels are probably still full," she said. My mind started to scatter all over the place. "How did I get here," I wondered? This is a mess and I wasn't sure how all of this was going to be corrected. 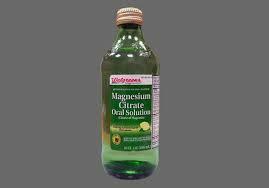 "You're not going to suggest I continue taking Magnesium Citrate are you?" I asked meekly. But inside I was screaming, "I CAN'T! "No, I don't want you to take any more of that." Then she recommended a milder stool softer/laxative called Miralax. "You should take it everyday," she said with emphasis. "Every day," I repeated, letting it sink. "Yes," she said, "everyday until your visit." "Huh, that's a full week of laxatives," I complained. She explained again, just like both the ER doctor and my HIV doctor, when your bowels are that full it takes time to clean. The week was manageable. I had a few near misses but for the most part I got through it with a breeze. By the end of that week, I could even tell when my tummy was sending me a message, "Get the hell up and head to the bath room!" The weekend was mild and then it occurred to me Sunday night that I hadn't gone to the bathroom all day. "Oh well," I shrugged it off, "maybe my body is tried." I knew that I was and I dozed off to sleep. By mid-afternoon on Monday I still had not pooped. By now I started to think that the Miralax was no longer working. One day not using the bathroom was one thing, but two days, was another. This was becoming way to much and a tad overwhelming. One moment I can't poop and the next moment I'm pooping all over the place. Fear started to raise in my spirit. I know the long term use of laxatives can be dangerous and addictive. I couldn't wait to see the doctor in the morning. My old GI doctor had moved into a sub-specialty around GI and I was given a new doctor. Dr. Lee I loved. First off, it was much easier talking to a woman about all of this. But she is young, bright and attentive. She patiently listened to my drama over the past two weeks. "I need a break," I explained. After she completed the rectal exam and there was nothing blocking me, she decided that I needed a colonoscopy. She wanted to do it on that Thursday, but since I hadn't used the bathroom in two days, she didn't think that the traditional colonoscopy prep would be enough to prepare me, i. e. clean me out. For those who are not familiar with a colonoscopy, your bowels must be totally clean of stool so that the doctor can see. The colonoscopy was important because people with HIV are prone to cancers. We needed to make sure that there was nothing going on that needed additional attention and might be inhabiting my ability to poop. First off, she wanted be to start taking a fiber like Metamucil everyday. Then pure dread came over me when she told me to take Magnesium Citrate everyday until it was time for the colonoscopy prep. I heard her clearly, but I was stuck somewhere between stupid and you have got to be kidding me. "So ummmmm you want me to drink a bottle everyday?" I asked. " Her head went up and down as she typed away at the computer sending my prescription directly to the drug store. But that's a lot Dr Lee," I complained. "Yes, but a weeks worth won't harm you and we have to get you clean." I walked into the waiting room shaking my head to Tiara who was waiting on me. I started complaining right away, "I can't believe this, she wants me back on Magnesium Citrate for the rest of the week." Tiara just shook her head," here you go again." And boy was she right. 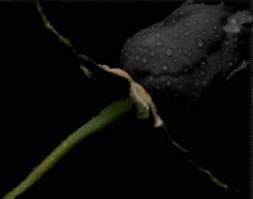 Each day became harder than the next. Each morning I would take Sophie for her walk then start my day. 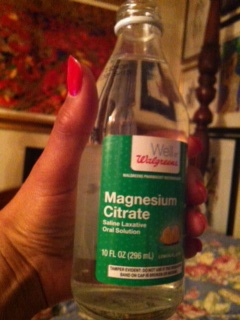 If I had to do anything that required me to be out of the house, I drank the Magnesium Citrate once I retuned and I carried extra bottoms. But again, I wasn't taking many chances because it was very unpredictable. By Thursday, my sprint had dropped to an all time low. No matter how I tried to prepare myself, it was a mess. It didn't matter what I was wearing because by the time I made it to the bathroom, it was coming down my leg and once I pulled down my bottoms it would gosh out like a sprinkler, everywhere, on the toilet, wall, shower curtain, rug, my clothes. I have never experienced anything like this in my life. Be clear, I'm use to diarrhea. I've taken medications in these last 25 years that caused it for sure, but I have never had an experience like this before. Not even when I did the prep for my last two colonoscopies. It seemed like the poop that was coming out of me was endless and angry. I was depressed. I was really depressed. 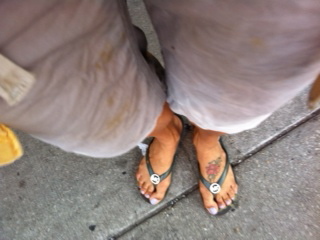 I started just throwing my soil clothes in the tub and washing down after each poop. I was just trying to make it from one poop to the next without loosing my mind. Tiara, had gone back to school, but she was giving me pep talks everyday. That was so refreshing! A young woman, who believed in me and continued to give me the push I needed. 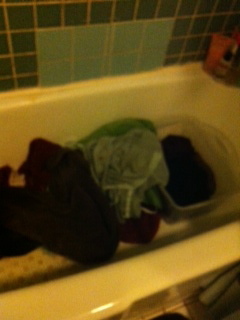 Thursday night, after one of her pep text's, I made myself wash the clothes and bleach down the tub. I took a long bath and tried to prepare myself emotionally for 3 more days. Friday and Saturday was more of the same. 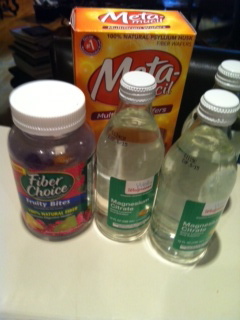 Sunday night when I started the official prep for the colonoscopy I thought for sure I would be almost clean. "My God," I said to myself, "as much as I've shitted this week, my prep should be a breeze." But it wasn't and still Monday morning at 3:00 A.M. when I finished drinking the balance of the prep, my bowels was not totally clean. Finally, the last poop before Tiara's grandmother picked me up at 6:00 a. M. to take me to the hospital I saw clear instead of brown. 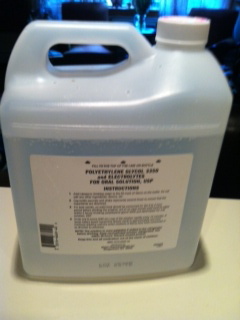 That meant I was totally clean and really for the colonoscopy. "Thank God," was ll I could say. After the colonoscopy I crashed, physically and emotionally.